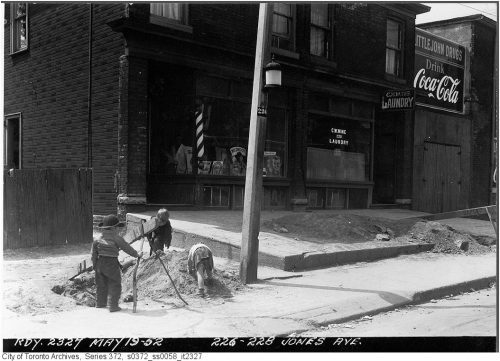 During the earliest days of the Toronto Hydro-Electric System, the streets of Toronto were still being lit by the lights of the Toronto Electric Light Company, alongside those of the THES. The last TELC arc light was lit on October 31, 1911, and the next day the THES took over responsibility for street lighting on all city streets. 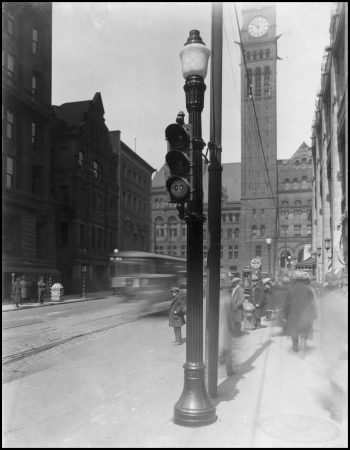 Between 1908 and 1911 the THES installed 18,000 single incandescent bulbs and 500 cluster lights on 30,000 poles. 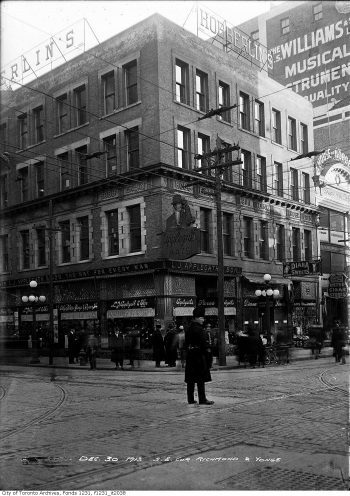 The primary need was to make the streets safe for pedestrians because there was very little automobile traffic on the streets at that time. The plan for residential streets was to have poles at intervals of 80 to 100 feet on every street and a 100-watt bulb on every pole. 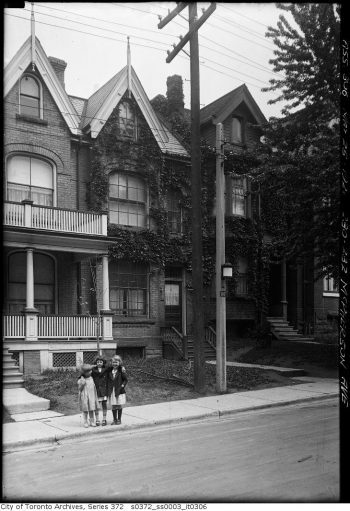 The lights were placed fairly low on the poles because there were so many trees in Toronto with low-hanging foliage. The light bulbs were enclosed in diffusing cylinders of opal glass. 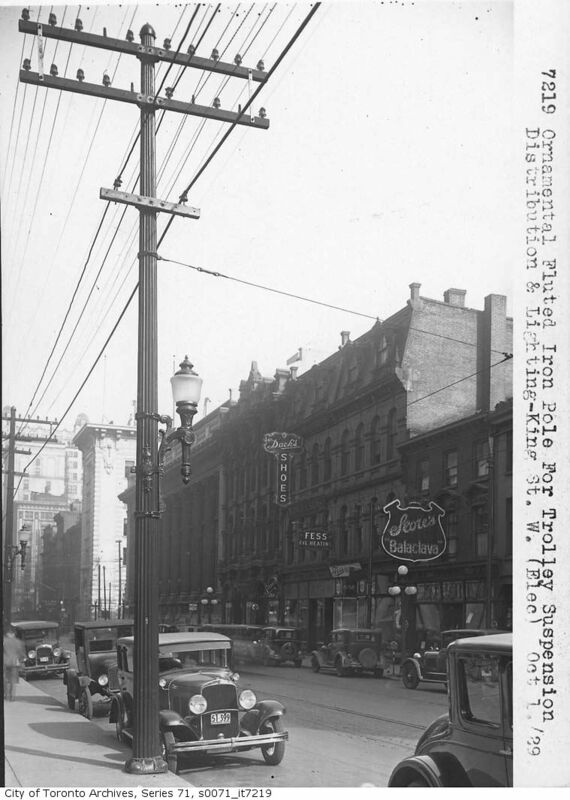 The busier streets in downtown districts were lit by ornamental cast iron pillars fed by underground cables, each having five, 100-watt bulbs. 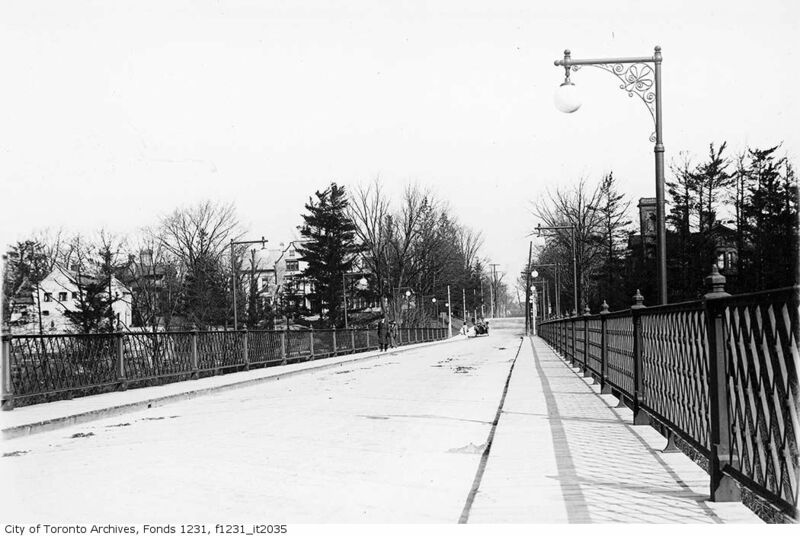 The light poles for this bridge were decorated with attractive iron work. The five-globe clusters of lights on ornamental iron poles provided greater illumination for busy downtown streets, and they were an attractive addition to the streetscape. 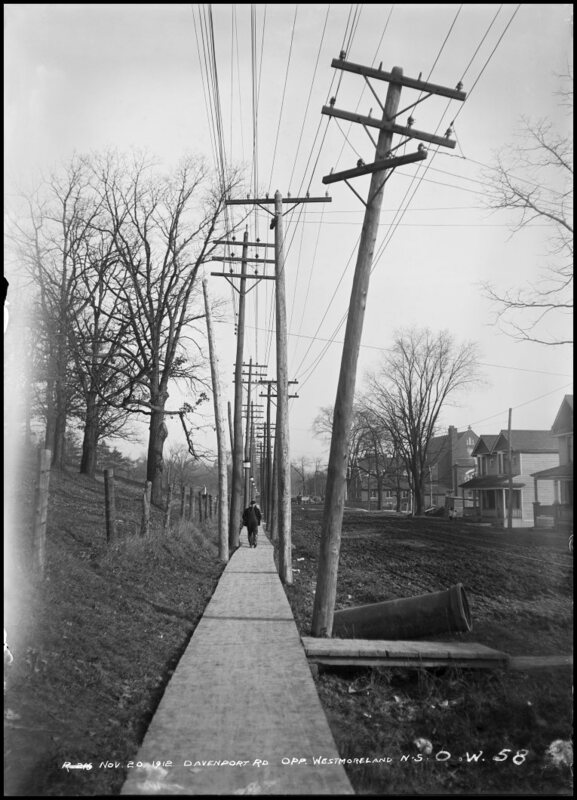 This photograph illustrates how the street lights enclosed by diffusing cylinders of opal glass were placed quite low on the pole to illuminate the sidewalk rather than the street. 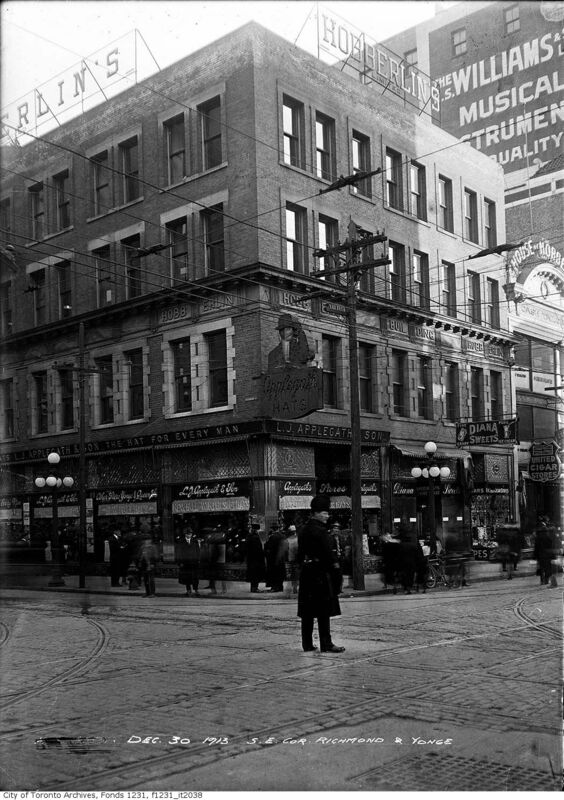 This iron pole which was doing triple duty was located in front of the Toronto Star building at 80 King Street West. Another style of ornamental iron pole is shown on Bay Street, with old City Hall in the background. This pole provides support for the traffic lights, as well as illumination for the street. With the increase of car traffic in the 1930s, Toronto’s street lighting was found to be inadequate. As the street lighting system had been primarily designed to light sidewalks, it is not surprising that the number of car accidents increased with the number of cars. Toronto Hydro began experimenting with various styles of mast arms to support the new more powerful lights called refractor luminaires. 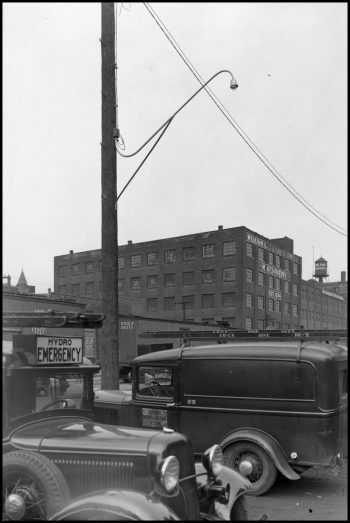 The high positioning of the mast arms and their length were designed for street and roadway lighting. 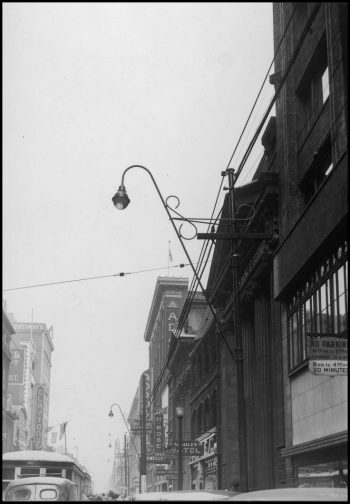 These mast arms on slender metal poles provided a light and elegant solution for improved lighting on Yonge Street. 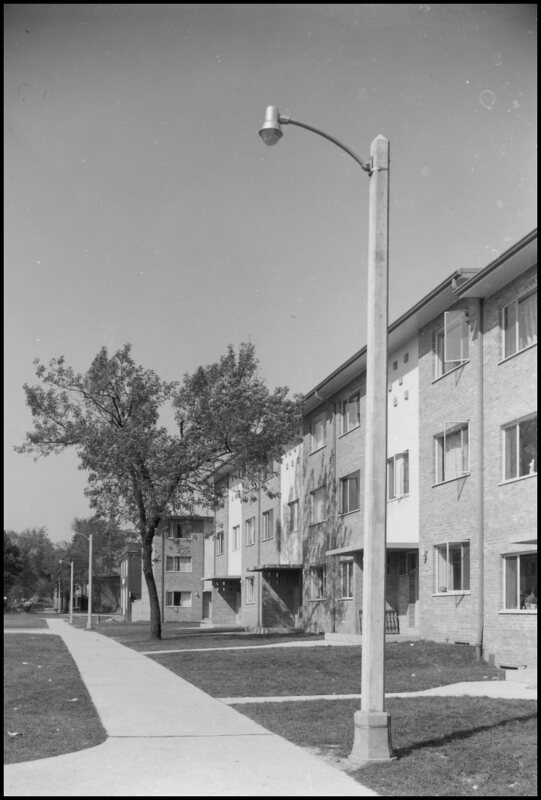 The Depression and World War II made it difficult for the THES to find the funds to upgrade street lighting, but at the end of the war, the commissioners made a start on installing new fixtures. 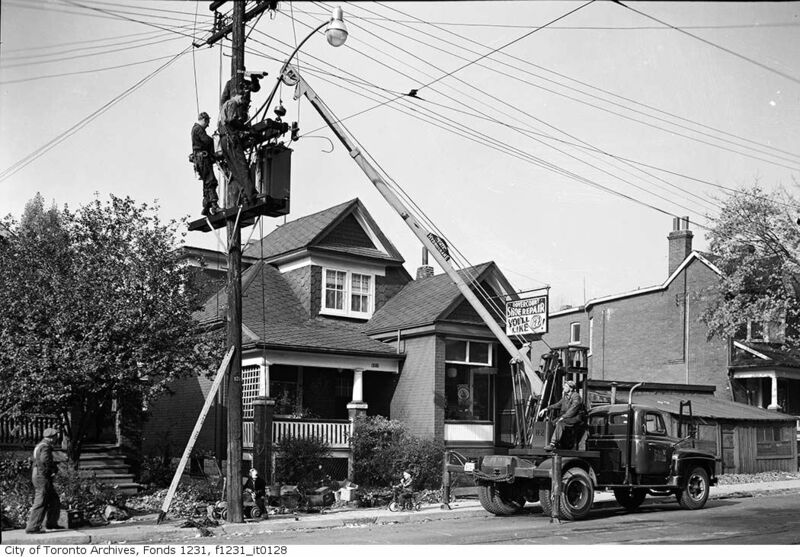 Post-war power shortages intervened, but by the end of 1951 about 40% of the whole program of new fixtures was in place. These lights were 25 feet above the roadway and 8 feet out from the curb. The new lights were called refractor luminaires. The hydro crane truck greatly facilitated the installation of the luminaires, although workers still had to climb up the pole to assist with the connections. It provided a good show for the little children below! The concrete pole provided a modern streamlined look for the new housing development of Regent Park.